No one can dispute the seemingly abrupt infiltration that technology has had in our lives over the past decade. In 2004, cell phones were well on their way to changing how we communicated and interacted with others. It wasn’t until 2010 that tablets became really popular, even though they’d technically been around for almost two decades prior. Today, you can sync your cell phone with your car, kindergartners use tablets in class, and most bill payments can be done online. Really, what did people do before the Internet? Technology has come so far that it affects our daily health in ways that seemed impossible and even magical a decade ago. With the introduction of smartphones and apps, it has become easy to utilize programs that record and monitor actions to create meaningful data while you’re going about your daily business, which, as we all know, must include a session of Candy Crush, Pinterest pinning, or Words with Friends. Even the most basic pedometer apps measure calories burned, distance walked, and steps taken while you text message or scroll through your Facebook feed. By opening an app and touching your phone’s camera lens, you can get a heart rate reading. The basic premise of these apps is to make our lives easier in one way or another, which is an important piece of living in the modern world. In recent years, some hearing aid manufacturers announced that new developments were underway to create Made for iPhone (MFi) hearing aids, and fall of 2013 marked the release of the first of them. With about 25% of all American smartphone users using an iPhone, it’s fitting that hearing aids take this first step. MFi hearing aids allow users to stream calls, music, and more directly through the hearing aids, control settings, and save locations with settings for future automatic adjustment. 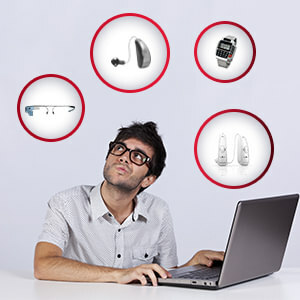 These all create a more seamless experience for a hearing aid user and a positive step toward wearable tech that improves health and lives. What’s in store for the future? Well, Google Glass is already underway, Japanese researchers are working on an Earclip-type Wearable PC, and Amazon has just debuted its wearable tech store. The nerds have had their revenge, and the decidedly uncool calculator watch is having the last laugh. It is indeed magic.